We give two guarantees on our products for your peace of mind – our 1-year money-back guarantee and our repair or replace warranty. Earthing is one of the easiest and most effective ways to naturally increase your vitality, health and wellbeing. Earthing may help you maintain good health or avoid health problems in the future or address issues you may have right now. We’re so confident that our earthing products will make a difference to your life that we offer a 1-Year Money-Back Guarantee on all Better Earthing products. 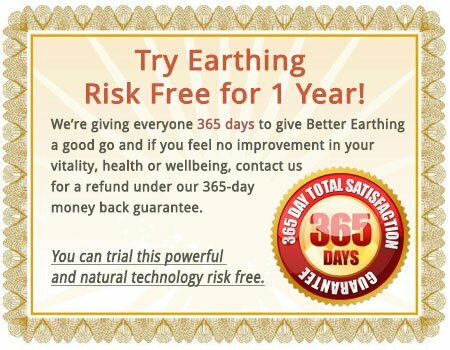 That way you have 365 days to experience the benefits of Earthing risk-free! No other earthing products come with a guarantee like this. We give 365 days because we expect that you will experience ongoing benefits from Earthing due to our high quality and long-lasting products. With Earthing, you need to top up regularly for ongoing benefits and maintenance. The benefits you experience at first can disappear when a poorly made product breaks down with wear or regular washing. Lower priced Earthing sheets or pads are often sold with no written warranty or guarantee on their effective earthing life. You may find that you need to replace them before long. Fabric mills have offered to sell us lower cost, low silver fabric and we said no. Our innovative product designs are made to last. For example, our sleep systems are designed as an undersheet, which protects it from wear and only needs washing every 3 months. That’s why we can confidently guarantee durability. If you’re not satisfied, all we ask is that you please let us know why and we’ll do our best to help you. Sometimes a simple tip makes a big difference can help you give the products a fair go over the 365 day guarantee. If we can’t help, we’ll give you a return authority reference. If you decide to return your products, they must be returned undamaged and in good working order with all cables, accessories, along with a copy of your purchase invoice. As per our care instructions, Better Earthing Sleep Systems must NOT have been damaged from washing with detergents containing bleach, whiteners, or oxidisers, as they oxidise the silver in the fabric and reduce the product’s conductivity and earthing effectiveness. If products are damaged through normal use while following our care instructions, you can return them for a full refund under our money back guarantee provided you have a return authority reference. Once received and checked, we’ll promptly refund your invoice value of the goods excluding the shipping cost on the invoice. We ask that you cover the freight cost of returning the goods to us. For assistance please contact Better Earthing Support on 07 5534 9307 (Aust) or 09 887 0912 (NZ) or email us at [email protected] and we can guide you through this process. Also view our warranty on the effective earthing life of your product.